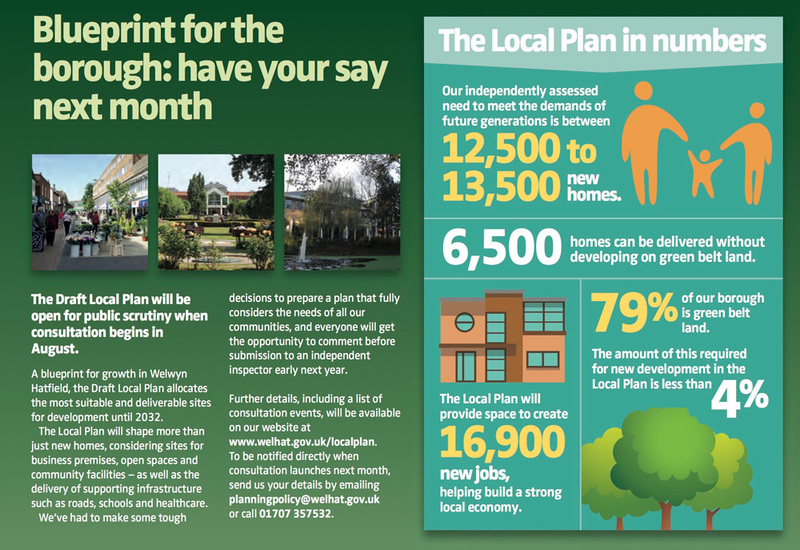 The Welwyn Hatfield Local Plan has been published in draft form. The public consultation process begins at the end of this month. Running for eight weeks, from August 30th to October 24th, this is an important part of the Local Plan process. To have your views heard on any of the sites, positive or negative, register here and follow directions. The demand for housing outstrips supply, and this enables speculative housebuilders to sell bland and often ugly housing at ever higher prices. As people live longer and population continues to grow, demand is unlikely to disappear. New homes and facilities will be required for children and succeeding generations. Dismissing development out of hand, or because it is simply close to where we live, adds little to the debate. We must take responsibility for ensuring the preparation of a Local Plan is a constructive process and to ensure that future development is of the highest possible quality. Please take time to read the Local Plan, and take a look at the sites. Consider the evidence. And then give your voice. Please do come, and discuss any thoughts or concerns you may have.